A sprained finger occurs when the finger is bent in some way causing damage to the ligaments which connect bones together. It is a common injury in ball games such as American football, basketball, cricket, and handball. A sprain can be helped by rest, ice and compression and also a taping method, details of which can be seen below. Finger sprain symptoms include pain in the finger at the time of injury. Swelling is likely to develop over the joint and there will be restricted movement in the finger. Later on, pain is likely to be more specific when bending the finger. To identify which ligaments might be injured by bending the finger in different directions to stretch the ligaments will reproduce pain. If there is a severe or a complete rupture of the ligament then the joint will be unstable. The finger has a number of ligaments which connect the finger bones or phalanges. The ligaments at the side of the phalanges joints are called the collateral ligaments. These are injured by a sideways type force bending the finger laterally or sideways. The thick volar plate is a kind of ligament which sits underneath the middle finger joint. A finger sprain can also occur through hyperextension or bending back of the finger joint. Rest the finger and apply ice. Ice or cold therapy can be applied for 10 minutes every hour initially reducing the frequency as symptoms ease. Do not apply ice directly to the skin as it may apply ice burns unless it is in the form of ice massage. Keeping an ice cube moving over the area should avoid ice burns. During the acute phase which is usually the first 24 to 48 hours elastic bandage or small finger sized compression bandages can be used to help reduce swelling. Once the swelling has died down the finger should be taped to protect the injured ligament while it heals. The taping will be specific to the ligament injured. When returning to sport it may be necessary to use a finger buddy taping where the injured finger is taped to the adjacent one for protection. As soon as pain allows mobility exercises to restore full movement in the finger should be done and eventually strengthening exercises with putty or hand exercise balls can restore strength. A surgeon may operate if required for more severe cases or a complete rupture. 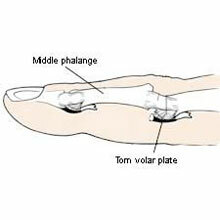 The volar plate is a very thick ligament which joins two bones in the finger. A volar plate injury occurs when the finger is bent too far back the wrong way, spraining or tearing the ligament. In some cases, this finger injury can also involve a fracture. Read more on volar plate injury and how to treat it here. Symptoms occur immediately after the finger is bent backward and includes severe pain in the injured finger which is located specifically over the middle finger joint. Swelling will develop quickly and the finger may appear deformed. Trying to move the finger will be painful and bruising may appear especially on the palm side of the middle finger joint. Volar plate injury most frequently occurs due to a hyperextension force – where the finger is over straightened and bent backward the wrong way. It is sometimes known as a jammed finger. The most common cause of this injury is ball sports where the ball forces the fingers backward. Volar plate is a ligament which separates the joint space of the proximal interphalangeal joint (also called PIP joints which join finger bones nearest the hands together) and the flexor tendons (which attach muscle to bone). The injury can just be to the ligament or can be an avulsion fracture where the ligament pulls off a small piece of bone at its attachment. This may also involve damage to the collateral ligament, known as a finger sprain. An X-ray should be sought to determine if there has been an avulsion fracture, or whether the damage is purely soft tissue related. If the injury is just to the ligament then it should be immobilized in a finger splint for up to a week to allow healing to occur. Then a gentle range of motion exercises can begin to prevent stiffening. Finger buddy taping should still be used in between exercises until pain-free to aid healing and protect the finger. If a fracture is present, it may require surgical fixation with wires or pins before immobilization. A dislocated finger occurs when two of the finger bones forming joints become displaced, injuring the ligaments and other soft tissue in the process. The finger will look deformed and severe pain will be felt. Medical help should be sought immediately, especially as there can be complications involving nerves and ligaments. A dislocated finger is caused by a traumatic impact of bending back of the finger. Symptoms include immediate pain with an obvious deformity of the finger. The patient will have great difficulty trying to move the finger. It is likely to swell up quickly and bruising may appear later. It there is any nerve damage then the dislocated finger may feel numb or tingly. Damage to blood vessels could result in the skin feeling cold and appear pale. A finger dislocation can occur in any of the joints in the finger, but occurs most frequently in the middle joint, between the proximal and middle phalanges. The most common causes of this kind of injury include jamming the fingers between something, such as a door and its frame, or a ball and a bat. It may also happen from a force on the end of the finger, overextending the joint. Fractures of the involved bones are common complications. For a joint to dislocate the supporting ligaments are also damaged. This is called a sprained finger. If a dislocated finger is suspected, then medical attention should be sought as soon as possible. In the meantime, don’t try to move the finger or put it back in place. If possible, buddy splints it to the next finger, apply ice or cold water and keep it elevated above the heart. This will help reduce bleeding and swelling. Any tight clothing or jewellery should also be removed. At the hospital, an X-ray will probably be taken to ensure there are no associated fractures. A Doctor will also examine the finger for signs of nerve or blood vessel damage. The finger joint will need to be reduced, which means put back in place. If this hasn’t happened naturally (sometimes it does) the Doctor will use a special manipulation technique to get the bones to move back into position. You may be given a local anesthetic injection to help with this as it can be painful. A second X-ray may then be ordered to check the joint is properly aligned. The finger will then be splinted or buddy strapped to the one next to it to immobilise it and allow it to heal. You will be prescribed painkillers from the Doctor and advised to rest, apply ice and keep the hand elevated when possible. A dislocated finger may take 4-8 weeks to fully heal and for full function to return (more if there are any complications). The aim of this taping is to prevent movement of the injured finger during the healing stage of rehabilitation. Fingers 1 and 2 are usually ‘paired’ for taping and 3 and 4 are usually best taped together. Read more on finger sprain taping. 2.5 cm (1 inch) nonstretch white tape. If necessary for small fingers a narrower tape can be used or the tape can be torn along its length to make thinner strips. A thin strip of padding foam to place between the fingers for comfort and protection. Apply two strips of 1.25 cm (half an inch) white nonstretch tape – one above the injured joint and one below. These will provide an anchor from which to attach the supporting strips. Place the strip of padded foam between the fingers to be taped. Apply two supporting strips from the two anchors above and below the joint around the ‘buddy’ finger. This taping should allow the fingers to bend together but sideways movement should be limited.